"In some ways I could say that God allowed all of these bad things to happen, but what I've learned to say is God removed all of the obstacles," Sharon Dobbins Alberson, Playwright/Composer, Minister and Lawyer, said of her trials. "Oftentimes when we see things that are going 'wrong', God is removing obstacles for what He wants to do," she continued. This has been the theme of her life, Alberson says. She made plans, but God always has the last say. "When things are going wrong, God is beginning to shape us and remove things in His love that He knows will not bring out what He wants for His glory," she shared, "And it draws us into a larger community, because we can really only see one person, but God doesn't call us to be one person, He calls us to be a part of the Body of Christ." One summer Alberson was approached by a woman at her church about a summer program for kids. 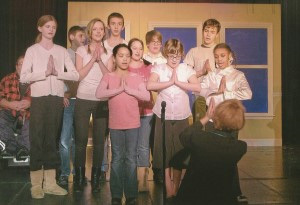 Alberson was asked to teach the choir dimension, which would turn into a children's musical. "She said 'Wouldn't it be neat to write (a musical)?'" Alberson recalls. 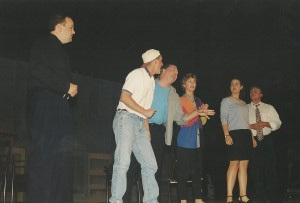 From that point, Alberson and two other church members decided to write their first musical. "They got busy, but with the wrong stuff. It was by default that I wrote the first musical," Alberson says. "It was morphing into something bigger than children," Alberson said. The advice she was given by a woman at the church was "Go with it, wherever it takes you". "I find that music really inspires people for good or ill, much more than the law. Demonic music can make you do awful things, but phenomenally spiritual or motivational music (can make you do great things)," she said. She loves the quote by Plato, "Forget about the laws, give me songs". "Think about the lyrics you remember as a kid, for good or bad, and all the radio you've listened to. How many laws do you know in your heart? Music and lyrics get into your heart," she said. "I found out the Torah was sung before it was ever written down. It was oral tradition," Alberson shared of what she learned in a course taught by a Rabbi. Music sparked a passion in her like nothing else. "All of this music was in me," she said. One night while hanging out with a group of Harvard Divinity School alums, Alberson made connections that would impact her and her musicals for a lifetime. "I played them the tunes and they were all excited about the musical," she said. During the evening she was given a list of local ministers that would be interested in being in a musical or who knew people who would. "I went around (town) like a salesperson and met all these different people. Then it hit me that I was supposed to be ecumenical," she said. Her first show would benefit Habitat for Humanity, The Council of Churches Homeless Project and an inner city Lutheran mission. "I made a vow that I would never take any money from the musicals, ever," she said, "It's not a recipe for everyone else, but it was for me." "My feeling has always been that this ministry is to benefit the least of these. 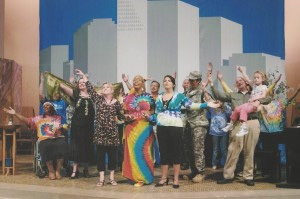 I look for the people who are vulnerable in society; people who are homeless, sick and dying, those with special needs, wounded war veterans… The charities to benefit have to be doing what the theme of the musical is all about," she said. Her dream became a reality in 1993, when her first musical, Law of Love, was shown to a crowd of one thousand people. They even made the front page of the Connecticut Post. Alberson did her research, met as many people as she could, and listened to their advice. "I learned to create the 1-2-3's of a successful endeavor," she said. "When you don't have a job, you have time. The most valuable resource any human being has is time, and what we do with that is stewardship." She was even on television and radio promoting her musicals, and the word spread rapidly. "God loves to create out of nothing. I didn't know what I was doing. I didn't have training in musical theater. I had no clue," she shared. Alberson learned much along the way, got professional training and wasn't afraid to ask for help. "I didn't get a degree, but I was vocationally trained. God sends the people in your life. If you look in the book of Acts, God is constantly sending people into your life to groom you for ministry," she shared. While in Divinity School she took a trip to Springfield, Missouri to write a paper on early women in the Assemblies of God, and will never forget what she learned there. Some of these women were part of the church when it was first founded in 1914. "It was phenomenal. These ladies were in their 90's," she said. But she will never forget one lady in particular, Adele Flower Dalton. "Adele told me 'Sharon, I'm going to tell you something about ministry. You can have all of the papers in the world, but if you don't have a ministry, you don't have a ministry'. And by papers she meant credentials. Then she said 'But if you have no papers and God's called you to ministry, you have a ministry'," she shared. "That helped me so much in life work, and it doesn't even just apply to ministry but to every dimension of your life. If you are pursuing your calling, it is obviously evident by everyone who looks at you, you are in your path," she continued. During the time of her first musical, Alberson received exciting news - she was pregnant. Things with the musicals continued to flow. "I started waking up in the middle of the night with lyrics for (the next musical) The Trial of Job," she said. It was clear that she was being inspired to do more…. "I remember going to the piano and feeling the music," she said. 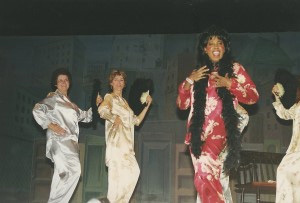 In 1998 her shows began to spread to different cities. She got a call from a woman from Daytona Beach Florida who later directed her shows in Daytona Beach and Kissimmee. "It was so fun, it traveled on its own," she said.